Within each dog breeds there are individuals of different sizes and this is the reason it is not possible for us to determined the size of the scent articles using the dog's breed. Your Obedience instructor is the best person that can help you find out the right size of scent articles for your dog. 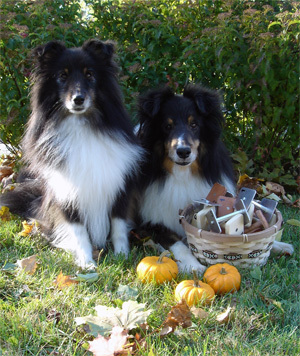 We always bring our scent articles samples when attending dog events. Your dog will be able to try them out to see which size would be best for him/her. The list of events we will be at is on the Events page of my websit. - Length of the dowel. The measurement has to be taken between the 2 sides where the space is the widest. Below is a picture of an Open dumbbell with an arrow showing where to take the measurement for the length of the dowel for the scent articles. Single dowel or double dowels? This choice will be made according to your dog. It is very important that the dog is comfortable when picking the article from the ground. Since dogs are already use to the Open dumbbell which is a single dowel, majority of dogs will be comfortable with single dowel scent articles. Time has shown us that 90% of dogs will be comfortable with single dowels scent articles. - Dogs with a very long nose (Collie, Borzoi, etc...). The length of the nose makes it so that the dog can not jpick up the scent articles from the ground comfortably. - Dogs that do mouthing. In some rare cases, having double dowels will prevent mouthing from some dogs.